This entry was posted on 24th February 2017 by admin. 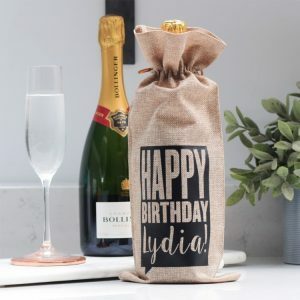 We have a new range of various alluring bottle gift bags suitable for special occasions which will make your gift one to remember but also make a modern alternative to the ordinary paper bag. 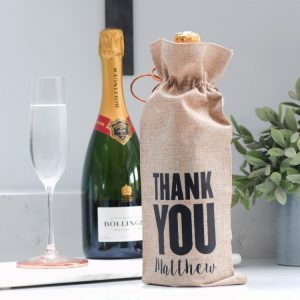 You can celebrate a special day with your recipients favourite bubbly encased in our personalised bottle gift bags which are made of natural and dense hessian fabric with a striking black vinyl print on the front. 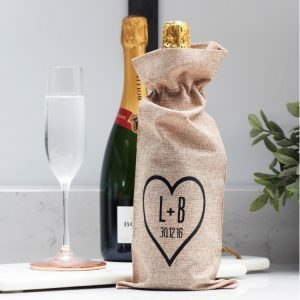 Each bag comes with a touch of personalisation and each can fit a bottle of champagne, prosecco or wine bottle comfortably. 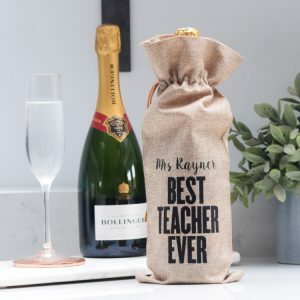 Ideal as a present for your helpers on your wedding, for saying thanks, for birthdays, or for a wedding or engagement gift to the happy couple. If this tickles your fancy, please click on the images below or can also click on the link supplied. Awesome! Please tell me that where can we personalised gifts like this? I want to buy this type of bottle for my daughter. Hi Harvey. We sell lots of personalised items on our website. If you click on the image on the post the bottle bag listing should show or can go through our homepage.